(Leah Hogsten | The Salt Lake Tribune) L-R Utah House Leadership, assistant whip Rep. Val Peterson, R-Orem, Speaker Brad R. Wilson, R-Kaysville, and whip Rep. Mike Schultz, R-Hooper, discuss SB96 during media availability in the speaker's chambers, Feb. 7, 2019, during the legislative session. Republican House leaders say they expect to vote Friday on SB96, a bill that replaces Utah’s full Medicaid-expansion initiative with a more restrictive — and initially more costly — plan to provide health-care coverage to low-income residents. But the bill relies on the state receiving a waiver from federal Medicaid administrators, potentially allowing Utah to pay 10 percent of the Medicaid costs for Utahns earning up to 100 percent of the federal poverty level, with the remaining 90 percent paid by the federal government. After a closed-door House Republican majority caucus meeting Thursday, leaders said they are discussing contingency plans to maintain health-care coverage in the event that Utah’s waiver request is denied. “Our caucus feels that is important, both options, that there is a fallback plan and that it is sustainable going into the long term,” said Rep. Mike Schultz, R-Hooper, the House majority whip. Schultz, House Speaker Brad Wilson, R-Kaysville, and other members of the House Republican leadership declined to provide specifics on what that contingency plan would be. But multiple Republican lawmakers confirmed to The Tribune that a developing proposal is to expand Medicaid coverage to those earning up to 138 percent of the federal poverty line — the same threshold of the full-expansion Proposition 3 — in the event that Utah’s waiver applications are rejected. 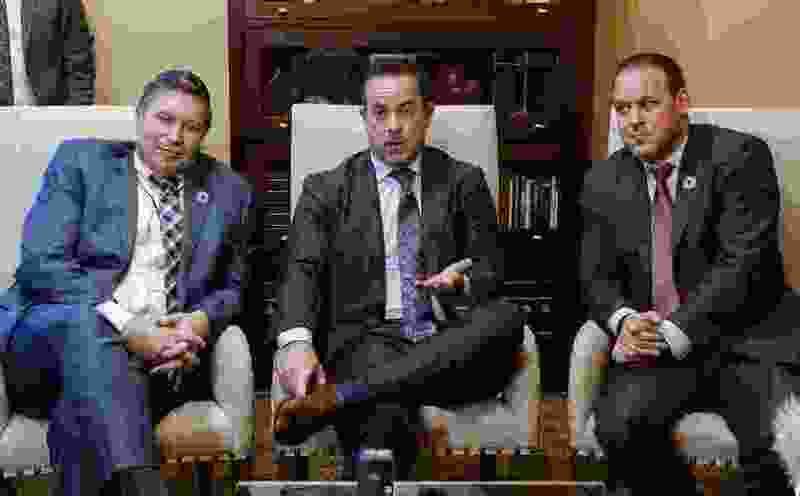 The lawmakers, who spoke on the condition of anonymity because they said they were not authorized to speak for the caucus, said the fallback scenario would still see the state pursue work requirements and other cost-protection mechanisms for the state’s Medicaid program. But those changes are believed to be more palatable to federal administrators under a fully-expanded program, compared to the partial-expansion plan that SB96 would implement on April 1. He reiterated his confidence that the state’s waivers would be approved, but said there is concern that SB96, as written, would run out of funds after 18 months, stripping Utahns of their health-care coverage. “The only space we’re trying to figure out right now is what to do in the unlikely event we don’t have these approvals sometime later this year in place,” Wilson said. Schultz echoed that concern, saying a fallback plan is needed to provide consistency to beneficiaries whether Utah’s waiver is accepted or rejected. Legislative leaders are hoping to secure two-thirds majorities in the House and Senate, which would immediately establish SB96 as law and allow for the rapid start of the waiver-application process. A two-thirds majority would also block Prop 3 supporters from overturning SB96 by referendum. On Thursday, Gov. Gary Herbert said he supports an April 1 launch of a Medicaid-expansion program that covers individuals up to 138 percent of the federal poverty level. SB96 would leave individuals above 100 percent of poverty to purchase subsidized insurance from the Affordable Care Act individual marketplace, which legislative leaders argue is as good or better than Medicaid coverage. “I think we’re moving in the right direction and I look forward to seeing the finished bill,” Herbert said. 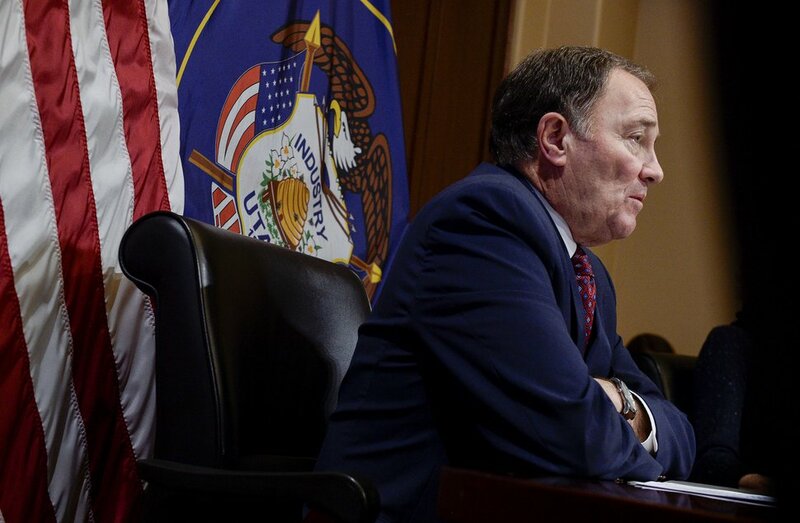 Leah Hogsten | The Salt Lake Tribune Governor Gary R. Herbert discusses SB96 and the bills similarities with Proposition 3 during availability with media representatives during the legislative session, Feb. 7, 2019. Estimates from the Utah Department of Insurance suggest that individuals between 100 percent and 138 percent of poverty would spend between $128 and $569 per year on health care, depending on their income level and use of medical services. Under full Medicaid expansion, Obamacare insurance subscribers are not required to leave their plans and switch to Medicaid. But they could not enroll in Medicaid under SB96. “We’re doing our best to try to find the best place for people long-term,” Wilson said. House Democrats are unlikely to support SB96, meaning a two-thirds majority in the House would require 50 of the 59 Republicans to support the bill. Wilson said Thursday that the caucus was not polled during their closed-door meeting. The bill received a 9-6 vote in the House Business and Labor Committee on Wednesday, with three Republicans — including the bill’s House sponsor — opposing it. Supporters of Proposition 3 have criticized the Legislature’s approach on SB96, arguing that less dramatic changes could be made to the initiative to protect against runaway costs. Wilson pushed back against those criticisms, saying lawmakers are working to preserve the spirit of Prop 3 in a fiscally responsible manner. Asked whether there’s been a public relations cost to the debate of SB96, Herbert said he’s “not keeping score,” and that what he cares about is getting the right policy in place. Herbert said it’s good to have a Plan B, but that “everyone will sing hallelujah” when Utah’s waivers are approved. “I expect that at the end of the day, the public is going to say ‘thanks for doing your job’,” he said. Tribune reporter Lee Davidson contributed to this article.